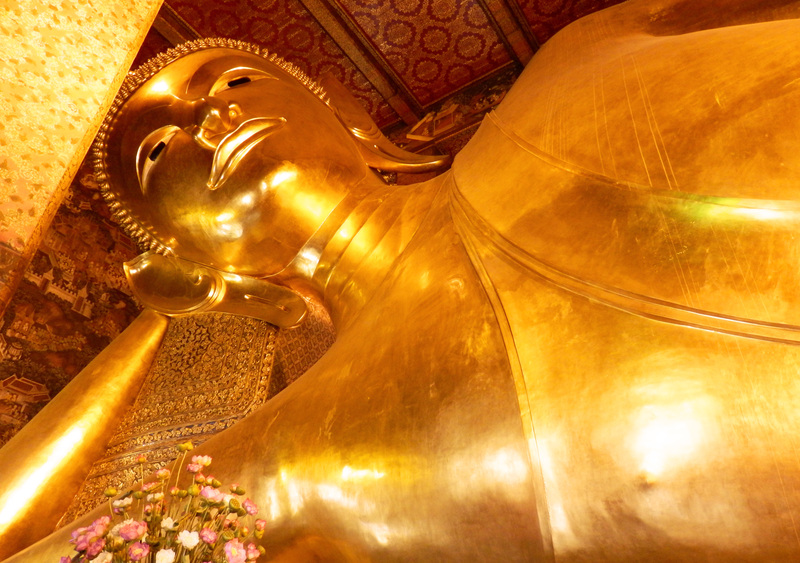 In continuation with the “5 Awesome Things to do” list series, here is one for Bangkok. Any traveler, whether luxury or budget will find a myriad of things to do. 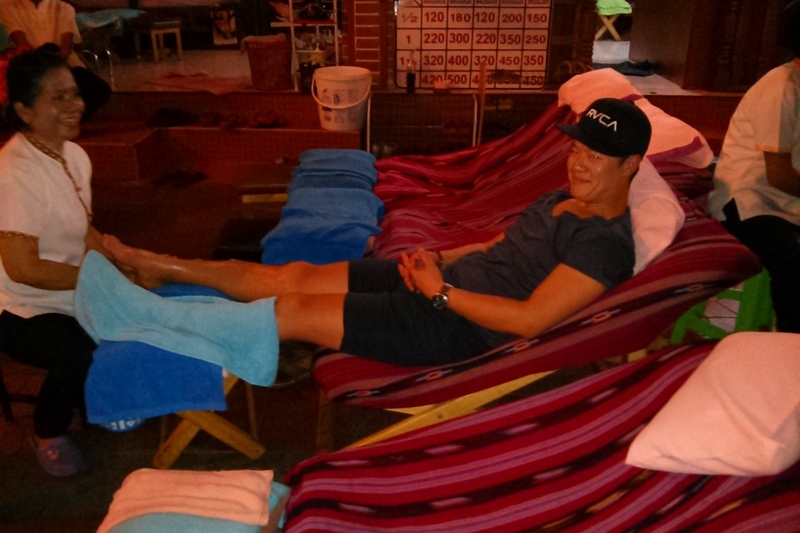 The days following my landing in Bangkok were spent doing anything and everything. The list is definitely geared towards backpackers but I hope you enjoy it anyways! 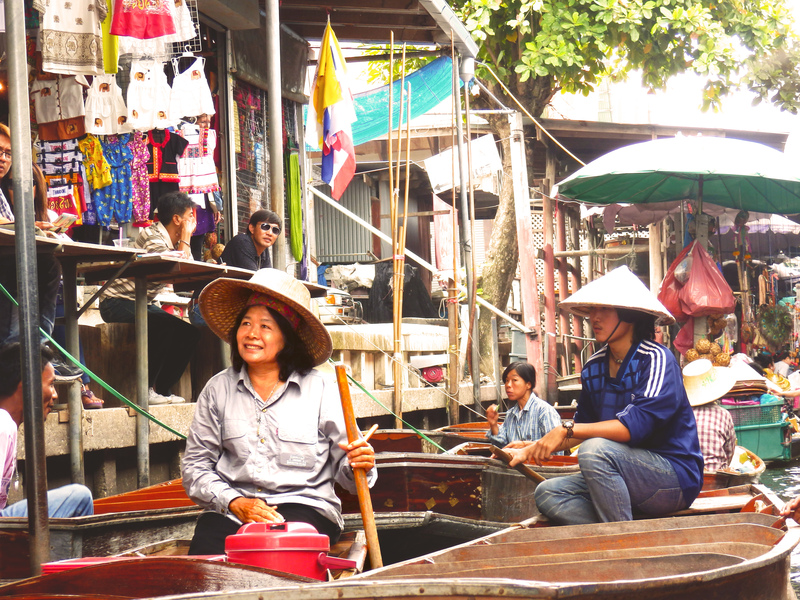 If you’re staying close to the backpacker district of Khao San road, there are no shortage of tour companies that offer very similar tours for a relatively inexpensive price. What you have to understand is that these tours are structured in a way that helps you spend more money. 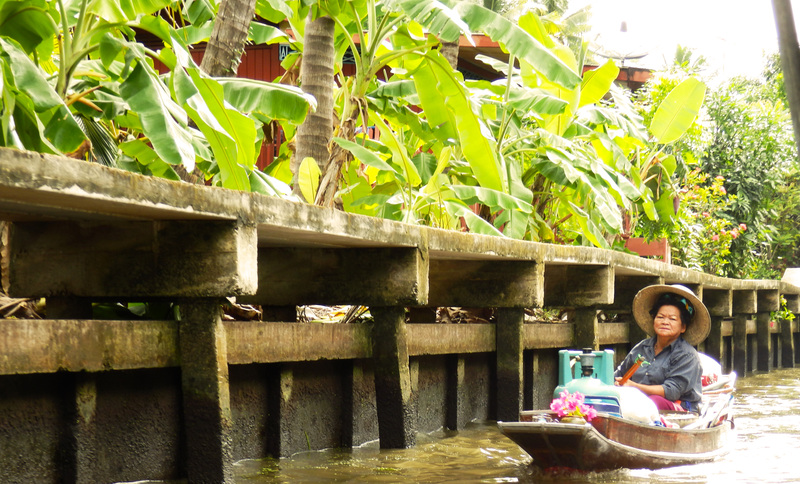 Paul, Jon, Ivan and I booked a day tour to the floating market about 2 hours out of Bangkok’s city limits. The cost was $15 and basically included the transportation in a van. We wake up nice and early and are our of the door by 7am. The market itself is what you’d imagine it to be. 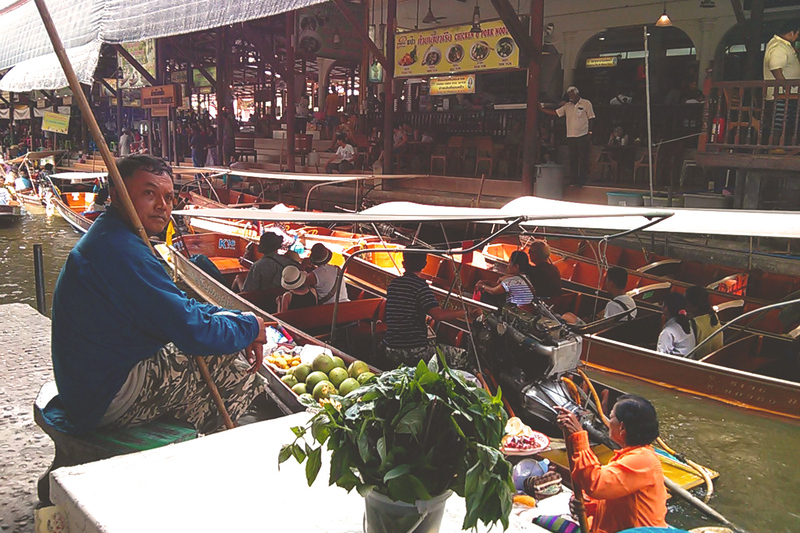 You’re riding along a long boat and floating down the market, with aisles on either side selling anything from food to souvenirs. Unless you’ve got a thing for random trinkets, skip these shops and head straight for the food! There’s fresh fruit, banana fritters, noodles as well as lots of different desserts, like coconut ice cream served inside the shell. The stalls are interesting to look at for sure, selling anything from clothes, stationary, art, souvenirs and spices (I got some nutmeg). 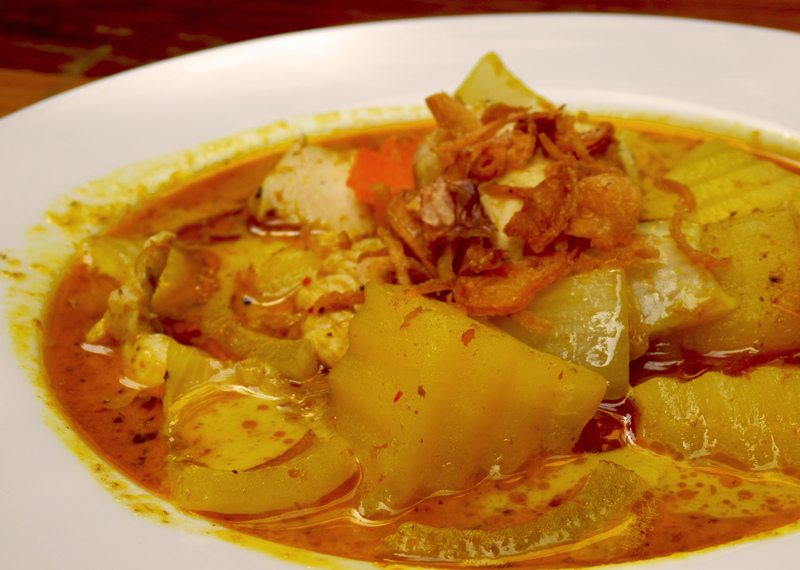 The highlight is just being in the atmosphere and enjoying the taste of Thailand. View of the canal where all the boats go. Its quite crowded. 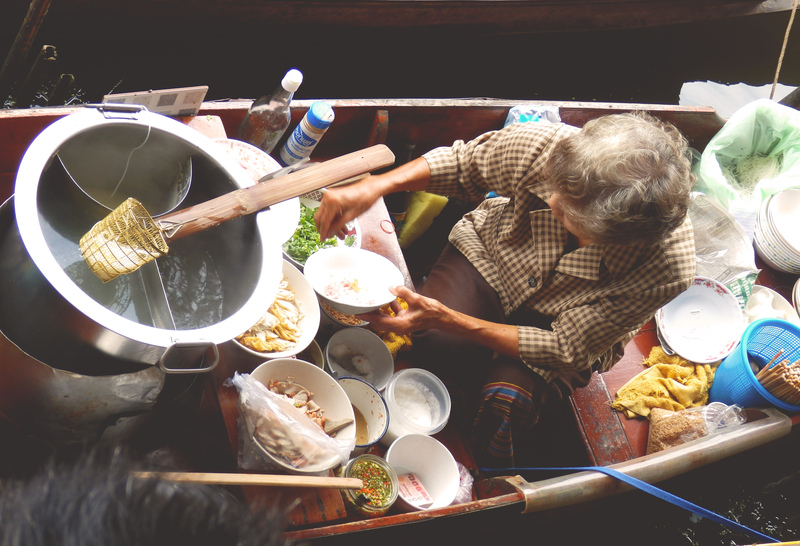 Lady selling noodles from her boat. You buy from another lady and eat it on the steps. You can definitely tell this is a popular attraction. 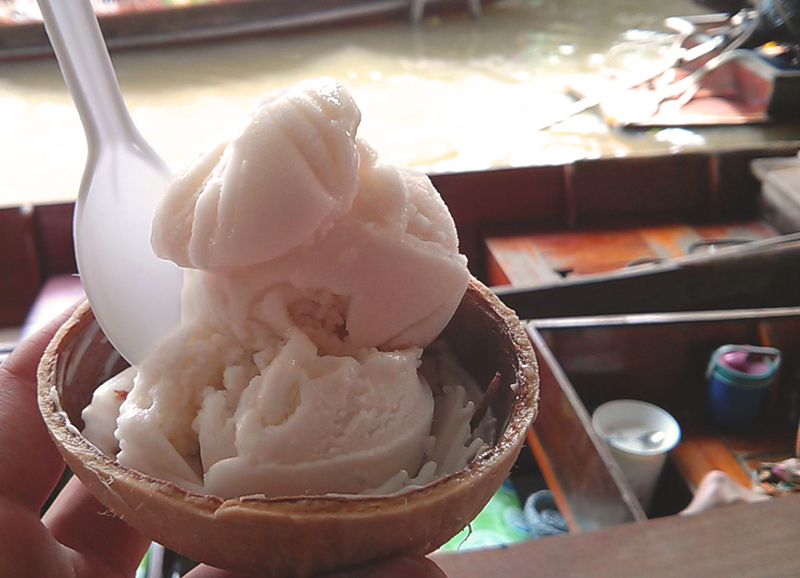 Coconut ice cream. I had quite a few of these while I was in Thailand. They have some great flavours like mango, taro and tea! Their Ceylon milk tea comes in both tea form (highly recommended) and ice cream, served with nuts. SO good! Funny enough, we were 15 minutes late for the pickup and the guide had to come looking for us. Ooops…when we got into the car, we joked with some of the other travelers and one of them asked if we were American. Ha!…take from it what you will. 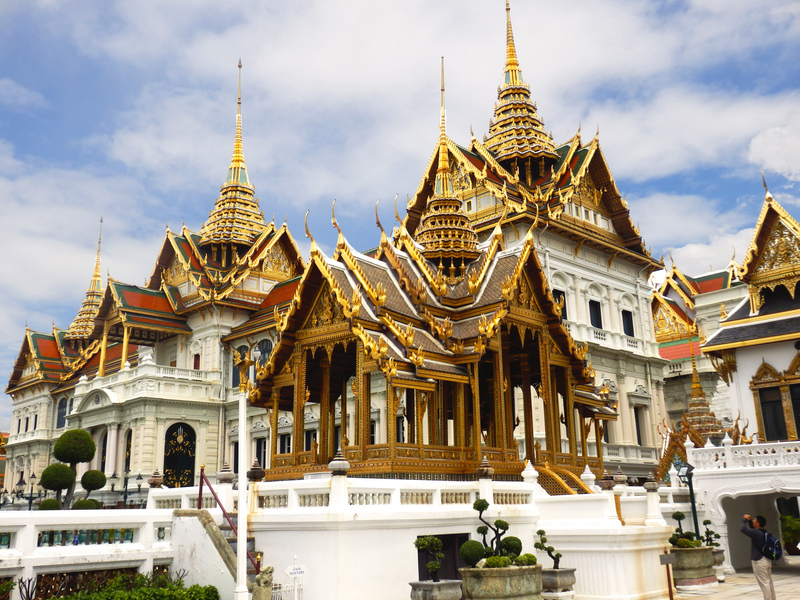 The Grand Palace is the former residence of Thailand’s beloved royal family, though it is still used for ceremonial purposes today. Admission is around $15CAD and there are strict guidelines for dress when entering the complex. Both mena and women must cover knees and shoulders so bring a change of pant or shirt. They’ll have clothes for you to rent but they’re really heavy, not a good combination with the hot, humid weather. Don’t try to sneak in. There is a multilingual guard with a megaphone at the gate making sure you’re dressed appropriately. One of the pavilions a little further into the complex. Very grand indeed! 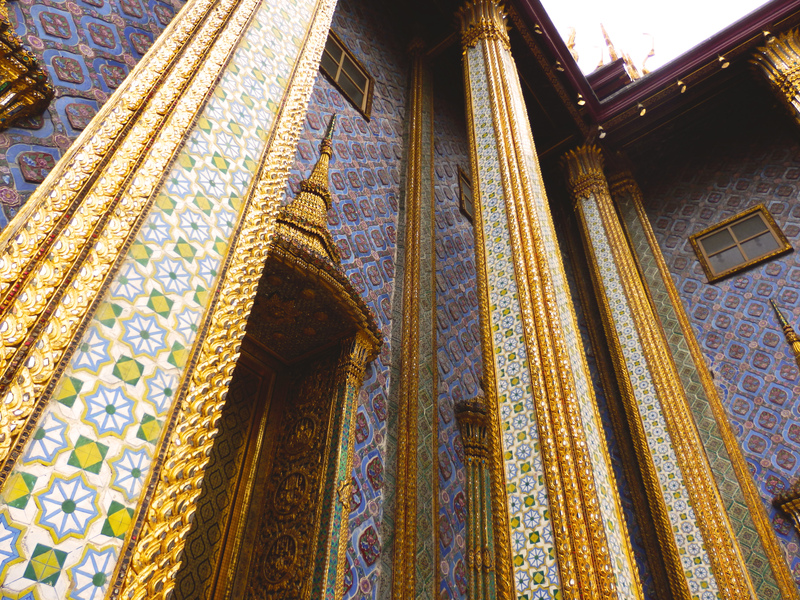 Amazing intricacy in every corner of the buildings. One of the pavilions near the entrance. You can easily spend a whole afternoon here. There are a number of palaces and pavilions, showcasing the grandeur of the royal family. 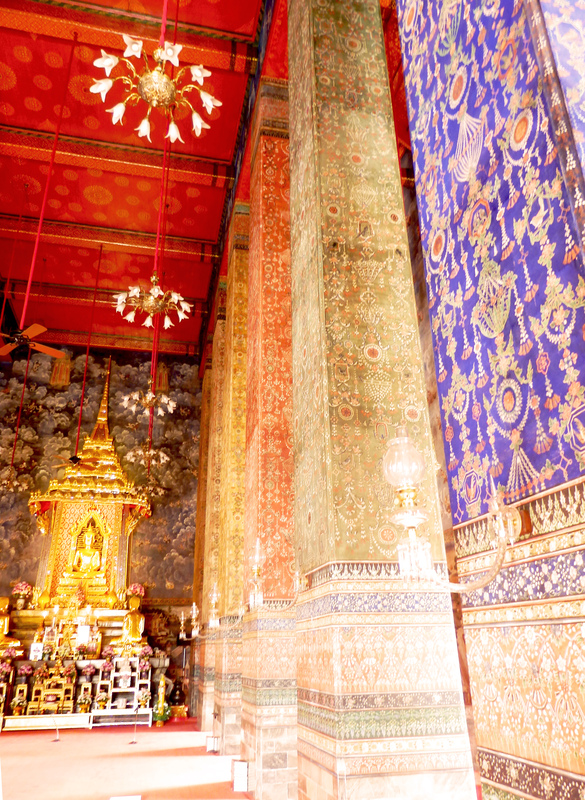 Showcases of historical/modern weaponry, jewelry, gardening, dress and areas of worship all pay tribute to the rich history of the Kingdom of Siam. If you’re a bit of a nerd like me, you’ll enjoy every bit of it! 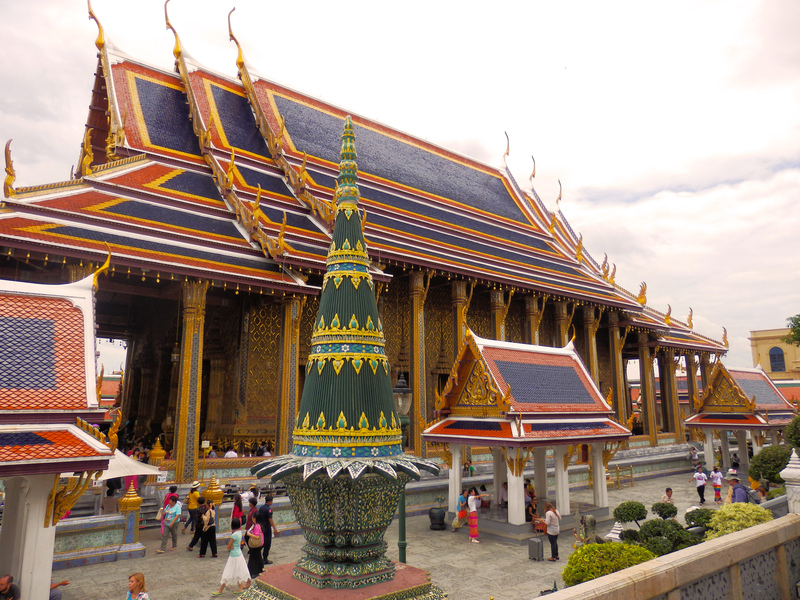 It is extremely easy to jump on a tuktuk and have the driver take you on a temple tour of the whole city. 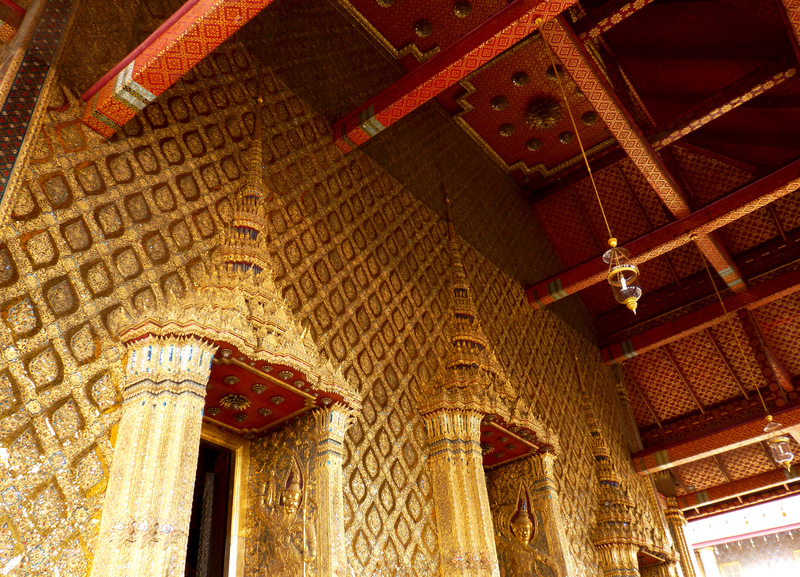 These temples are meticulously built and showcase great detail and artistry in their construction. However some of them are in various states of disrepair. Beware is the touts. If a tour on a tuktuk seems too cheap, they’re probably planning to drop you off in various shops (mostly custom suit shops) in hopes that you’ll spend some money. If you have all day then going along with it can be a great way to save but if you don’t want to deal with the fuss, tell the driver you aren’t interested in the extras. Unfortunately, there are so many temples (Wats) that I forgot the names of most of them. Again, intricate beauty carved and painted into their temples. I think this one was the “lucky Buddha” temple. When we did our tour of the temples, we agreed to visit these extra shops in exchange for the cheap cost of being driven around. I rode with Ivan, Jon rode with Paul. At first its OK but it seriously get awkward after walking into the 3rd suit shop and politely turning them down. On the way one of our tuktuks broke down and our tuktuk ended up having to be dragged by the other…by a rope. Our driver simply put the engine on neutral! The bars along Khao San are quite popular. On any given night there is someone belting it out or singing along to a guitar. For the most part, they are extremely talented and know the songs to sing to get you going! Next thing you know you’re singing along with them! The bars are also a nice way to just unwind at the end of a long day of exploring the megacity. Beer is pretty cheap (Chang is my favourite, a strong beer at 6%+) and shisha is available at many bars. It’s also a great way to people watch. On our last night in Bangkok before flying home to Vancouver, Carrie and I sat at my favourite bar at the bend of Khao San, and met a nice French couple just beginning their trip to Thailand. It was great to just chat with fellow travelers and hear the excitement in their voices about the awesome time they were ready to have. Not to mention, a relaxing massage is always affordable and relaxing after a long day. There are literally tons of these around so take your pick. 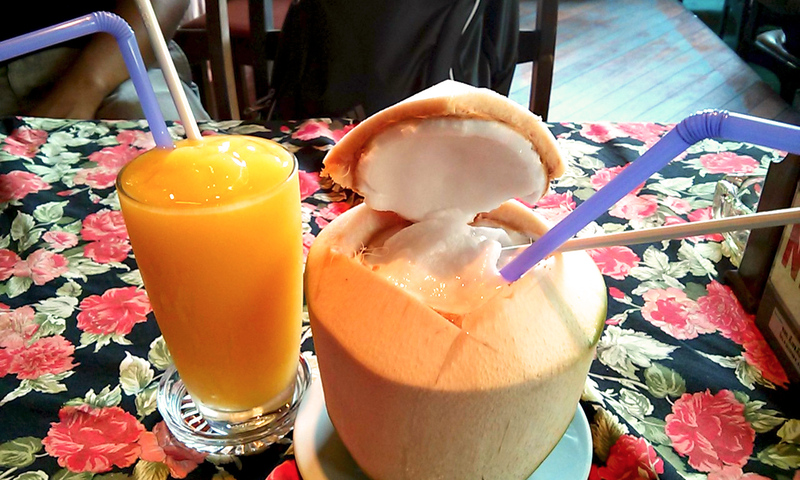 Coconut smoothies. Mandeep and Sam told me about these from their trip to Thailand and I gotta say they don’t disappoint. Had one of these every week. However, do note that coconut milk gives you diarrhea if consumed in large quantities (apparently). These were my absolute favourite. 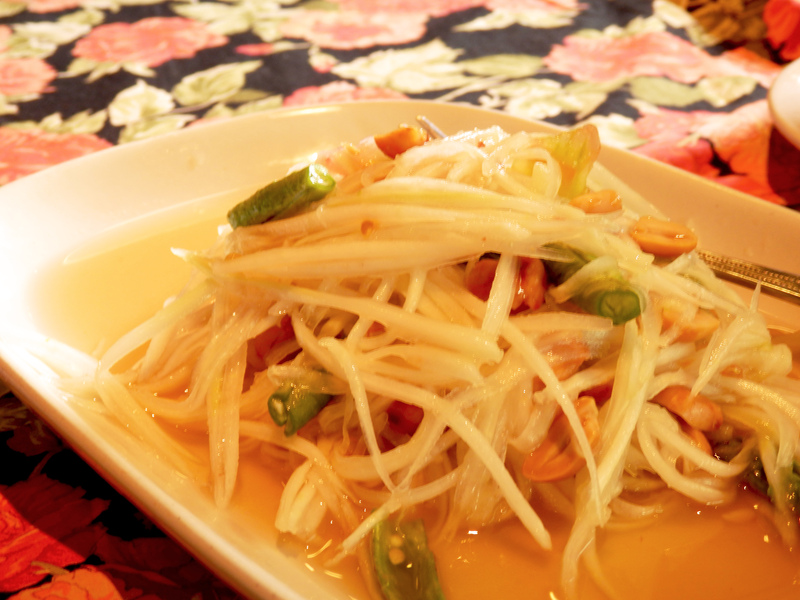 Crunchy, fresh, yet pungent papaya salad. 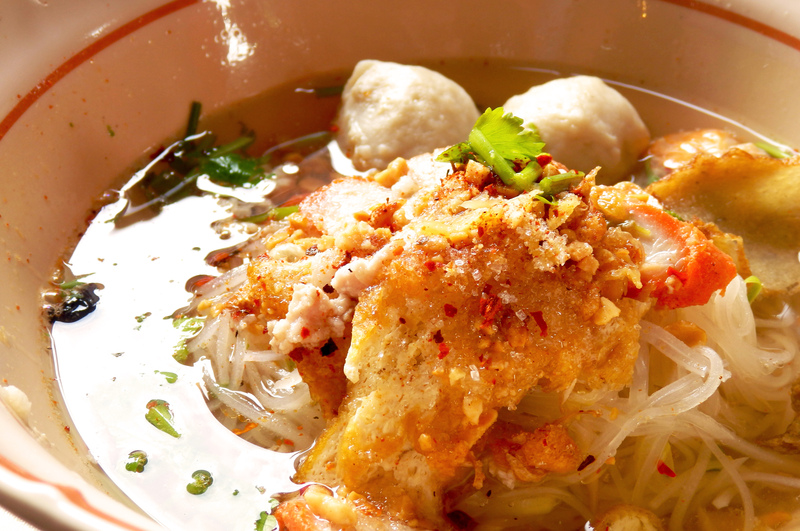 SO many great noodle dishes to try. Beef noodles from Chatuchat market. Made super fresh to order. FYI it was a beef broth but the actual meat is pork. 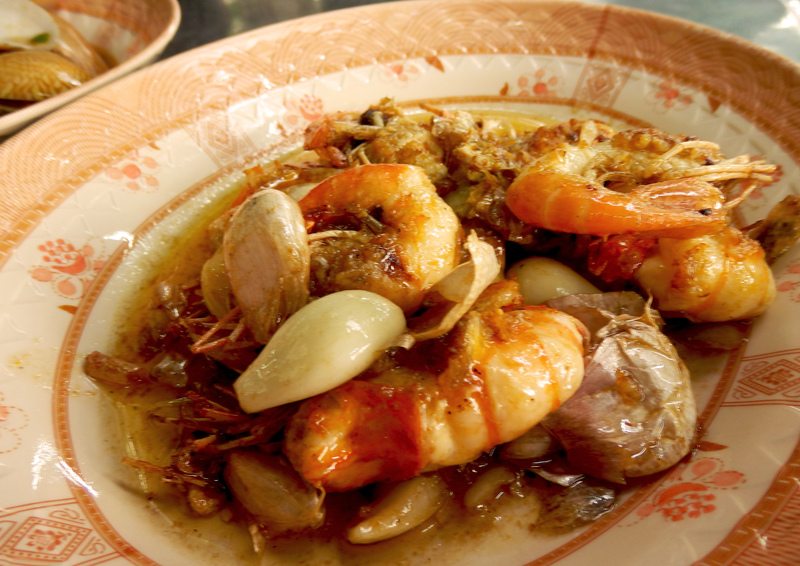 Garlic and prawns: a combination that transcends cultures for good reason. This was at a roadside sit down place. 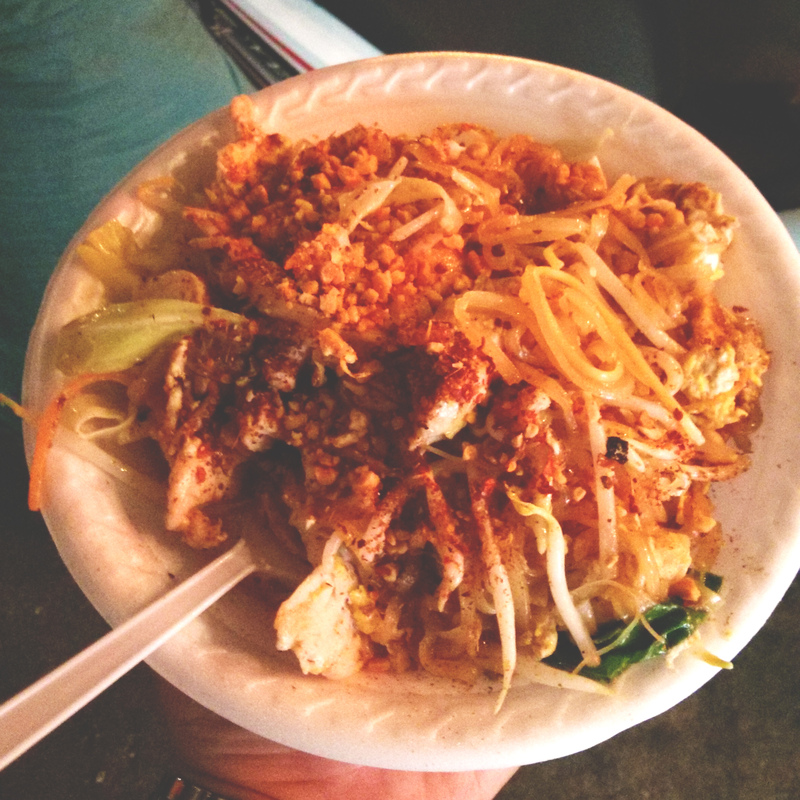 There is, though, a special place in my heart for pad thai. Historically speaking it’s not a particularly old dish (<100 years old), and has been heavily North Americanized (ketchup in the sauce?…). Pad thai embodies many elements of Thai cooking, mixing textures from chewy noodles and crunchy peanuts, to mixing savoury, sweet, spicy and sour. Try it from a busy street vendor a couple bucks and you will not regret it. SO good. Made fresh from a street cart. Plenty of those around. Special mentions for food go to random street side restaurants, where you can get clams sauteed with basil, chilis, ginger and garlic, as well as tasty veggie and noodle dishes to tantilize your tastebuds. 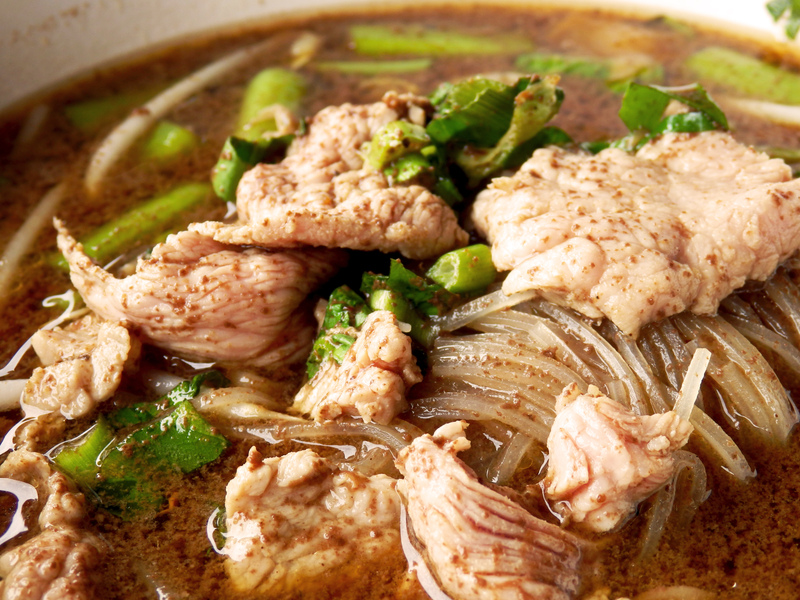 If you are in Bangkok you will not go hungry. I hope you’ve enjoyed my list! I certainly enjoyed writing it and reliving these great experiences. 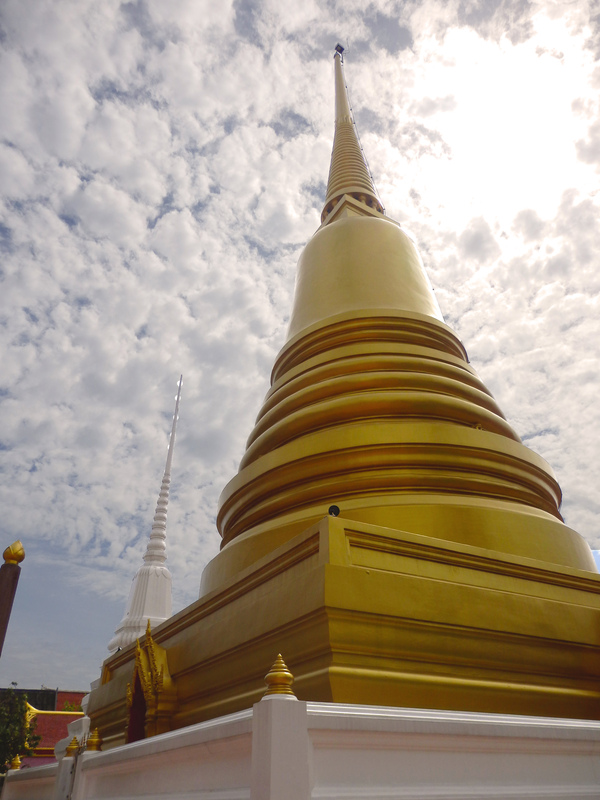 Feel free to share some of your favourite travel experiences in Bangkok. I’d love to hear them! 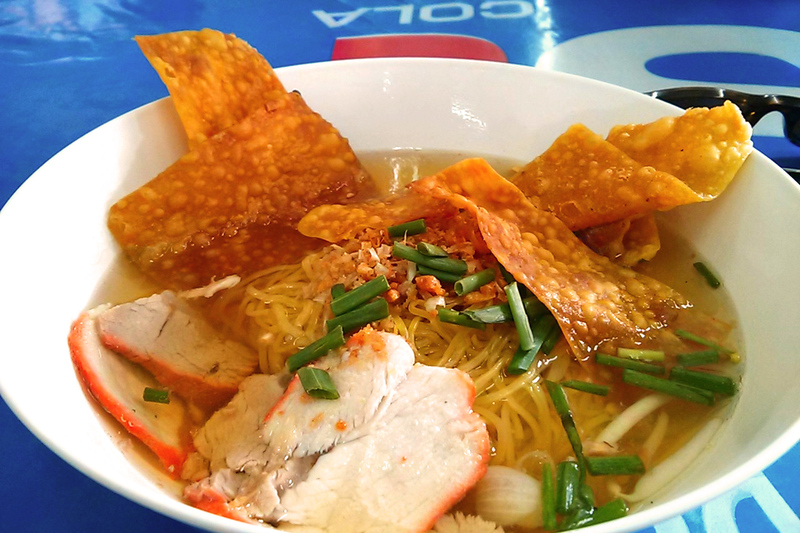 Staying in Khao San is convenient if you’re planning to hang out here the whole time. It can however get quite noisy. Try staying just a few blocks outside the main area. It’s quieter but still within walking distance from the bars and pubs. If you’re big on markets, check out Chatuchat (or JJ) market. 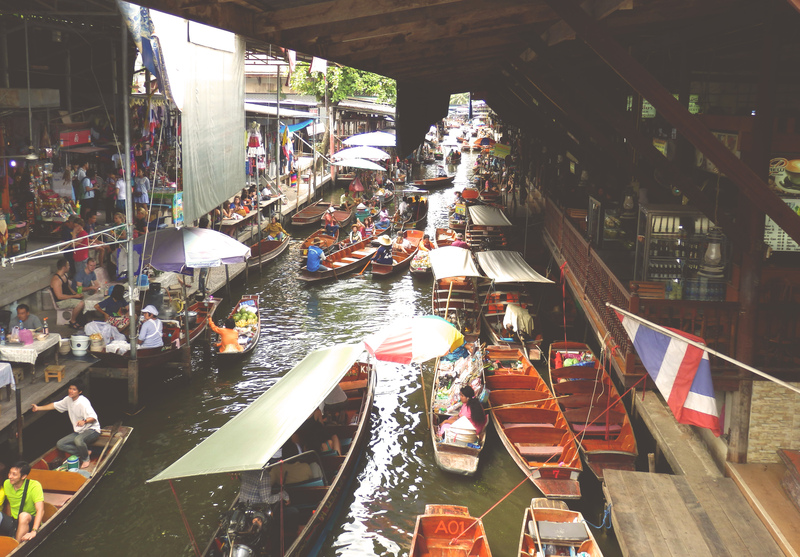 This is the biggest market in Bangkok and you can buy pretty much anything under the sun. Lots of local art is available for purchase and for large items shipping to your house can be arranged. I spent an afternoon here and it was enough for me. Lots of shops but nothing I’d really buy. The beef noodles there were pretty tasty though haha. The market is right by a monorail station of the same name. Just follow the people.